there are a few new items which are now available in the RDVC Shop Click here. It's good to know we are also known in many parts of the 'non-English' speaking world. We are about to have a new section on this site which would enable visitors to 'Sell' or 'Advertise for' Anglo Zulu War related items. The full conditions for use will be outlined in the section called 'MARKET PLACE'. were able to retrieve some of it. 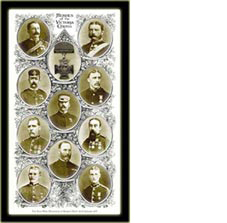 Do you collect rare Zulu War medals? If so, be on your guard. In the last month, three such high-value duplicatesâ€š have been offered for sale, as original medals. One was a Rorke's Drift defender, which was offered to an auction house, and two were Isandlwana casualties, offered to the public. Unfortunately, these named duplicatesâ€š have not been officially issued and the genuine items are already in existing collections. To eliminate the possibility that the originals had been switched at some time, the originals have now been exhaustively tested by independent professional numismatologists, and the original medalsâ€š genuineness verified. The three duplicatesâ€š have also been examined and the combined opinion of the experts is that these previously unseenÂ duplicatesâ€š are genuine Zulu War medals of low value, but skilfully re-named to indicate 24th Regiment Isandlwana or Rorkeâ€šs Drift participants. They have probably been altered using lasers before being re-silvered and then treated with aging chemicals. Advice; when considering such an expensive purchase, either buy from an accredited auction house or ensure you have a written money-back guarantee from the seller, for the full amount, in the event that your proposed new medal is already in existence. Remember; the fact that a medal is listed on the official Medal Roll does not mean that every named medal offered for sale is genuine; paperwork is even easier to forge. If you decide to purchase such a medal, at least check with one of the top auction houses to ascertain its provenance. Most well known significant Zulu War medals, especially Rorkeâ€šs Drift and Isandlwana, are already in private collections or housed in military museums so you should also check with the appropriate Regimental Museum they might still have the genuine medal in their display. Finally, once such a duplicateâ€š medal has come to light, it has no commercial value. The heroism of two local soldiers during the Zulu war will be remembered at Shaw Street Cemetery, Ruddington, Nottingham at 1 pm on Sunday 18 July. Nottinghamshire men, Privates Caleb Wood and Robert Tongue were part of the small garrison at Rorke's Drift, Natal on 22 January 1879 when the mission station was attacked by a force of 4,500 Zulu warriors.Â Both Rorke's Drift Defenders returned their home village of Ruddington after many years of army service.Â On their deaths, they were buried in unmarked graves in Shaw Street Cemetery.Â As a result of a newspaper article last year highlighting the daring deeds of these local men at Rorke's Drift, the Nottingham Co-op Funeral Care Service offered to place a suitably inscribed headstone, free of charge, on each grave. Caleb Wood and Robert Tongue enlisted together into the 24th Regiment in 1877 and continued their army service into the South Wales Borderers.Â Robert Tongue died age 60 in 1918, but Caleb Wood was one of the last defenders to die in 1935. The rededication of the graves started very much as a family affair with many relatives of the two soldiers planning to be present. 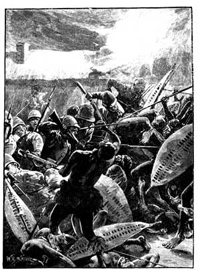 However, such is the international interest in the Anglo-Zulu war, many distinguished guests will now be attending, including senior members of the Zulu Royal family, The Lord Mayor of Nottingham and other local dignitaries, soldiers from the Royal Regiment of Wales (24th/41st Foot), relatives of other defenders of Rorke's Drift, as well as many other friends. Musicians from the Clive Band of The Prince of Wales' Division have kindly agreed to attend and provide the music at the service.Â Although the band has a busy official programme, their Director of Music, Major Stephen Barnwell is a Nottinghamshire man and is proud to able to play a part in the re-dedication. awarded to members of the 24th Regiment.Â The highest number of awards given to a Regiment for a single action. Hit statistics for RDVC.com - In January, we had our busiest month ever with over 24,000 visitors!! February followed as our second busiest month ever with nearly 18,000 visitors! This brings our year to date total number of visitors to over 150,000... Many thanks to all of you for your support! *	Zulu Dawn is being re-released on DVD on 29th March 2004 in the U.K.
We are adding a new section to the website and invite submissions for inclusion. It will be called (for want of a better word) Pot-pourri. It will have articles of a general Zulu War nature covering events, personalities etc. Also invitedare anecdotes, poems, interesting myths and asides. Relevant images (which are not subject to copyright) to accompany pieces would be welcome. Ken and Mike Allen were at a service held for James Langley Dalton, January 22nd., 2004 at his grave in Russell Road Cemetery, Port Elizabeth. blanks for the service. The shots were fired prior to the bugler sounding the Last Post and Reveille. They felt that it was a great honour for both of them to be able to perform this duty, the smell of burnt black powder in the air reminding you of those tense moments of heroism during the heated battle. The service was held by members of their Moth Shell Hole, Prince Alfred's and Senior Officers and NCOs of PAG. The uniform and insignia being that of their Regiment, Prince Alfred's Guard. PAG is the third eldest Regiment in the country and affiliated to the Royal Highland Fusiliers. A new book, compiled over two years by Ron Lock and Peter Quantrill is now available. See our 'Books' section for full details. A new book compiled by Ron Lock and Peter Quantrill, co-authors of 'Zulu Victory: the Epic of Isandlwana and the Cover-Up', is now available. A great companion to the authors' 'The Red Book'. A Special Living History Event is being held at the Royal Engineers Museum in Chatham. and HRH Prince Joseph of the Royal Zulu household. Meet the Die Hards - Modelling and Dioramas - Artefacts, Militaria, Films and Sounds. A South African tycoon inspired by Anglo-Welsh heroism at the Battle of Rorke's Drift is to donate Â£20 million to the Royal Opera House and Wales Millennium Centre. Donald Gordon, 73, said he would make the gift - one of the biggest ever to the arts in Britain - to strengthen ties between cultural bodies in England, Wales and South Africa, all key players in the Zulu wars. The Johannesburg-born philanthropist, set to retire as chairman of Liberty International, the largest owner of shopping centres in the UK, is now based in London and has dual citizenship. The Royal Opera House in London's Covent Garden, which just five years ago was in financial turmoil, and the Wales Millennium Centre on Cardiff Bay waterfront will each receive Â£10m over the next five years. The Centre will put Â£6m into completing construction work for its opening in November 2004. Last night it acknowledged a debt of gratitude to the Welsh redcoats who helped a regiment of just 150 to hold out against 4,000 Zulus at Rorke's Drift in 1879, creating a legend that has captured the imagination of millions. The Zulus had stunned Victoria's Empire with the slaughter of 1,334 British soldiers and their African allies on the slopes of the hill Isandlwana. 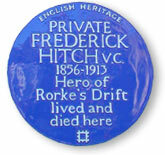 Hours later the 24th Regiment defended Rorke's Drift, earning 11 Victoria Crosses, more than any other regiment at a single battle. The feat was celebrated in the 1964 film Zulu, starring Stanley Baker and Michael Caine. Announcing his donation, Gordon - ranked 51st on a recent UK 'rich list' with Â£560m - said: 'I hope to recapture the great historic relationship between England, Wales and South Africa, particularly the Welsh, in the late nineteenth century. I've got a triangular arrangement with the Royal Opera House, Cardiff and South Africa. Sitting below a painting of the Battle of Isandlwana, one of five from the period by South African artist Gail van Lingen hanging in his offices near Westminster, Gordon added: 'They were great days - I'm sorry I missed them. Sir David Rowe-Beddoe, chairman of Wales Millennium Centre and a longstanding friend of Gordon, said: 'We certainly owe a debt of gratitude to the Welsh at Rorke's Drift. If we ever produce Zulu, The Opera, I imagine that Bryn Terfel would be excellent in the Stanley Baker part. Gordon is among a select band of the super-rich who have given British culture a shot in the arm. Oil heir John Paul Getty II donated Â£50m to the National Gallery and Â£17m to the British Film Institute, while his son Mark gave Â£10m to the National Gallery. John, Simon and Timothy Sainsbury's munificence included the Â£35m Sainsbury extension to the National Gallery. Garry Weston, inventor of the Wagon Wheel biscuit, donated Â£20m for the British Museum's Great Court. Gordon's first business venture in Britain was jointly founding Abbey Life Insurance with Mark Weinberg in 1962. He founded Liberty International on his 50th birthday in 1980 and has steered into the FTSE-100. It owns MetroCentre in Gateshead, Europe's largest shopping centre, as well as The Lakeside Shopping Centre in Thurrock, Braehead in Glasgow, the Victoria Centre in Nottingham and Eldon Square in Newcastle upon Tyne. The company's property portfolio is worth Â£5 billion. 'I have considerable pleasure in being a bit of a philanthropist back home,' he said. 'I have great fun out of making serious donations and somehow it all comes back again one way or another. Two images of Corporal Ferdnand Christian Schiess' VC medal have been added to his details page, there is also a zoomed image of the back of the medal. The Zulu War! - A Special Living History Event is being held at the Royal Engineers Museum in Chatham. Guests of Honour, HRH Prince Velekhaya Shange and HRH Prince Joseph of the Royal Zulu household. A report from Martin Everett's recent trip to India when he visited Bromhead's grave is now online. For details of others' trips go to 'Your stories'. Just a quick note about Lt. Chard's grave. You can no longer drive up to the church unless you're attending a wedding/funeral. We think the big house has been bought by someone who objects to people using his driveway so now you have to park in the village (outside the pub) and walk !! There is a public footpath that runs up the side of the house grounds but be warned - it is unmade, used by horses and in wet weather could be very muddy! It's a good ten to fifteen minute trek from the pub. Hopefully this will be a temporary barrier and maybe a polite letter is in order to the owner of the house explaining how important this site is to visitors of all ages. Nearly every entry in the visitors' book was saying that they had come to see Lt. Chard. This image was sent in by Ian Essex, and is of his brother, Andrew in front of the Cattle Kraal at Rorke's Drift. It is, of course, one of the Polo Shirts from our shop! Thanks Ian! !